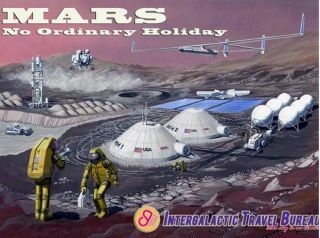 A sample postcard for a space vacation to Mars from the Intergalactic Travel Bureau, a project put on by the science outreach organization Guerilla Science. NEW YORK - If you're thinking about taking an exotic vacation this summer, why not look beyond Earth to one of the many intriguing destinations in our solar system? If that sounds good to you, a science outreach group may have just the ticket. The U.K.-based organization Guerilla Science has created a mock travel agency to teach the public about spaceflight and our solar system by planning far-out trips to nearby planets and moons. The Intergalactic Travel Bureau will be featured as part of Guerilla Science's exhibit at the FIGMENT Art festival, which is being held this weekend (June 9 and 10) on New York City's Governor's Island. The free event is designed to spur imagination and invention between artists and the public in participatory ways. The festival will provide a perfect setting to debut the Intergalactic Travel Bureau in this country, said Mark Rosin, a physicist at UCLA and one of the founders of Guerilla Science. "We did this at the Royal Observatory in London about a year and a half ago, but this will be the Travel Bureau's first journey to the United States," Rosin told SPACE.com. "The response was so positive. The fact that it's playful makes it much more enjoyable, and it takes the onus away from learning something." "Say they want to take a cultural trip, we might suggest they go to Jupiter, where there are interesting artistic patterns in the atmosphere," Rosin said. "If they're looking to go somewhere nice and sunny, we might suggest Mercury. If they prefer skating, there are other places with excellent conditions for that. We want to make this playful and interactive, with a lot of educational content." The mission of the Travel Bureau is to engage the public in science and astronomy in a way that is fun and interactive. "The goal is to get people thinking about space travel and help them to get to know the solar system around them," said Olivia Koski, a journalist and member of Guerilla Science. "The Intergalactic Travel Bureau creates these casual, fun ways of talking about the planets: Mercury is great for sun worshippers, and you better pack your sunscreen because the sun is [six times] brighter in the sky there than it is on Earth. And make sure to bring an oxygen tank when you go to Venusbecause the atmosphere there is carbon dioxide. It's a way of personalizing or humanizing these mystical far away objects in the sky — objects we know so much about now after decades of space exploration." With several private companies developing new spaceshipsto take astronauts and other paying customers into orbit, a new industry of space tourism is taking shape. Rocket builders, such as Hawthorne, Calif.-based SpaceX, are paving the way for paid trips to low-Earth orbit, potentially making the idea of space vacations something for the not-too-distant future. "I wouldn't be surprised at all if within my lifetime, sooner rather than later, that [SpaceX CEO] Elon Musk sends someone to the moon for the first time in over forty years," Koski said. "So that's already making at least one of our vacation packages a reality. There will be an employee at SpaceXwhose job it is to price out a package for a moon adventure. It will probably be way more than any average person can afford, but that makes the Intergalactic Travel Bureau so much more realistic." Rosin and Koski will both be present at the FIGMENT Art festival this weekend representing Guerilla Science. The Intergalactic Travel Bureau project is financed through FundaGeek, a crowdsourcing initiative to help people raise money for scientific and innovative programs. Supporters can pledge money for the International Travel Bureau project through the FundaGeek website. The FIGMENT Art festival will run from June 9 to 10 on Governor's Island. The free event features other space-themed exhibits, including a musical performance called "Leonids," named for the meteor shower, and a game of mini golf that was inspired by the Atari arcade game "Asteroids."